Jason Hillyard fished Lower Birgam on Tuesday 4th September. He says “his biggest fish to date, great gillies and company, largest fish caught that day on the Tweed so unlikely to happen ever again, one very happy fisherman.” Well done Jason and thank you for sharing the image with us. I’m sure you have every chance of getting a mention in the daily biggest fish again. 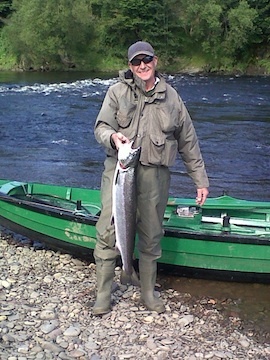 This entry was posted in Uncategorized and tagged Angling, boatmen, fishing, FishTweed, gillie, Lower Birgham, River Tweed, salmon, spring salmon, Tweed, Tweed Valley. Bookmark the permalink.